This video shows a summary of the work done in . In this work we studied the problem of designing and controlling an aerial manipulator that is able to push and slide an NDT probe on the curved surface of a pipe. These 3 videos are a showcase of the general theory developed on  for any multi-rotor system, to the case of an hexarotor. The counterintuitive fact that standard hexarotors are not failsafe is explained and experiments showing that a tilted hexarotor is instead failsafe are shown. This video shows three experiments with the the new OTHex platform developed by us at LAAS-CNRS. The OTHex is a multi-directional thrust hexarotor with a simple arm that is able to assist in lifting and transporting long bars. These 3 videos show several comparative experiments on the new controller we developed for fully-actuated platforms: differently from state-of-the-art pseudoinversion-based controllers our proposed controller can cope with lateral force actuation bounds by prioritizing the tracking of the position over the rotational one. If the reference 6D trajectory is feasible then it is perfectly tracked, otherwise it is tracked at best while guaranteeing the overall stability of the platform. This video shows the new concept of MAGMaS: Multiple Aerial-Ground Manipulator System, which combines the strength of ground manipulators with the large workspace of aerial robots. This video shows a new method to control aerial manipulators that are procentric exploiting differential flatness and decentralized control. This video illustrates our recent work on the algebraic conditions to obtain static hovering (i.e., with zero linear/angular moments) and on our method to control any generic multi-rotor with static hovering capability, even when propellers are tilted and the force/moment actuation is coupled. This video shows the control of physical interaction for the Tilt-Hex, a fully-actuated hexarotor platform. These videos shows a group of aerial robots autonomously maintaining the connectivity while exploring several targets simultaneously in a fully distributed way. This video introduces the differential flatness and control of protocentric aerial manipulators with any number of arms and possible elastic joints. This video shows the modeling and control of a new hexarotor concept named FAST-Hex: a Fully–Actuated by Synchronized–Tilting Hexarotor. This video shows human in the loop simulations with a haptic interface using our method to control a group of aerial robots to cooperatively manipulate an object like a flying hand. This video shows real-robot experiments using our method on maneuver regulation controller for VTOL aerial robots. This video shows real-robot experiments using our method solving the mutual localization of teams of ground and aerial robots with anonymous bearing (camera-like) measurements. This video shows our work on the design and control of elastic-joint arm for physical aerial interaction and manipulation. These videos show our works on the cooperative manipulation of an unknown load with a group networked mobile robots. 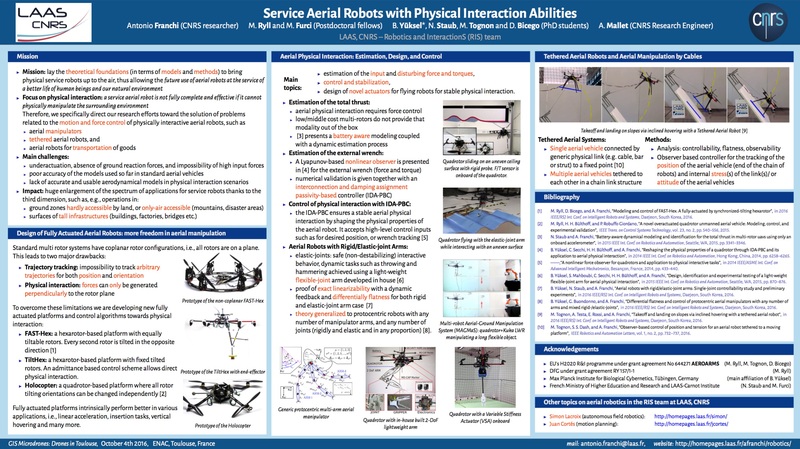 This video shows our work on the bilateral teleoperation of aerial vehicle with physical interaction. This video shows our work on the total thrust modeling and identification using onboard accelerometer and battery level information. This video shows a human in the loop simulation demonstrating the use of the "flying hand" a distributed hand made by several UAVs each representing a finger of the hand. This video shows the application of an aerial clearing algorithm whose goal is to let a group of aerial robots to explore a network of roads in a completely decentralized way. This video shows some simulation results on the application of a novel type of control for physically interacting UAVs based on the IDA-PBC framework. This video shows experiments on demonstrating a control technique that allows to use a quadrotor as a 3D force effector, i.e., in order to exert a given 3D force on the enviroment. These two videos show experiments where a quadrotor platform is able to autonomously regulate its velocity based only on a RGB-D sensor and IMU (External motion capture system is used only as ground truth). This video shows the capabilities of the ROS-based TeleKyb software framework for decentralized control of multiple quadrotors and human-machine interaction and haptic teleoperation. These videos show both hardware-in-the-loop simulations and real experiments of a control method that allows a group of mobile robots (e.g., quadrotors) to achieve the desired formation only resorting to bearing (angles) measurements, like the ones that are retrievable from an on-board camera. This video presents a framework where persistent autonomous behaviors are planned by a robot while the human operator is in charge of modifying online some geometric properties of the current behavior. This video illustrates a motion planning technique solving the problem of planning a trajectory that connects two arbitrary states while allowing the a quadrotor UAV to grasp a moving target at some intermediate time. These videos shows a group of UAVs autonomously maintaining the rigidity of the formation in a distributed way. This video shows the intercontinental bilateral (with force-feedback) shared control of a group of quadrotor UAVs implemented using a network connection based on a VPN tunnel between Germany and South Korea. These videos show a group of mobile robots (real and simulated ones) while clearing an environment in a decentralized way without using neither global map nor a global localization system. The robots have limited-range communication and perception. These videos show the potentiality of a new decentralized control that ensures the maintenance of a novel concept of connectivity. The generalized connectivity concept is able to embed several constraints, such as obstacle and inter-robot collision avoidance, limited visibility, limited range, and many other both local and global group objectives. This video shows a human operator using a haptic device to teleoperate a group of 9 physically-simulated quadrotors and 3 ground mobile robots by controlling the velocity of only one leader. In the video UAVs have limited-range and line-of-sight communication and perception. This defines an "interaction graph" whose topology can vary over time depending on the particular state of the system. These videos show a human operator using a haptic device to teleoperate a group of 4 UAVs by controlling the velocity of only one leader. These videos shows an experimental implementation of a bilateral teleoperation of multiple UAVs. The UAVs act as a group and keep a spatial formation: they behave as a semi-deformable rigid body that translates, rotates, and shrinks because of interaction with the environment (obstacles). The human operator controls the overall motion of the group and feels on its master device the reflected environmental forces. This video shows a human operator using a haptic device to teleoperate a realistic physical simulation of a team made by 6 UAVs (quadcopters) by means of controlling the velocity of only one leader. This video shows a human operator using a haptic device to teleoperate a realistic physical simulation of a team 8 UAVs (quadcopters) in cubic-shape formation. This video shows simulations and experiments of a 3D encirclement strategy for collective control of multiple robots (both 2D and 3D). This video shows a set of significant simulations of the multi-robot pursuit-evasion algorithm. The first part presents a simulation with three searchers in a eight-shaped environment and explains the basic concepts of the algorithm. The second part presents a simulation in a bigger environment, and the third part shows the emergent behavior in open spaces. This video shows simulations and experiments of the SRG (Sensor-based Random Graph) algorithm for multi-robot exploration. The robots are equipped with a laser range-finder. Experiments with small-scale robots are showed. This video shows two mutual localization experiments performed on a team of 5 Khepera III mini-robots equipped with laser range-finders. In the first experiment all robots participate to the mutual localization process, while in the second experiment two robots do not communicate their data to the others, and therefore are identified by the filter as moving obstacles that "look like robots".